You’ve probably heard the “story” where all animals in Australia are just there to kill people. While this is mostly for fun, there is a kernel of truth to this statement. Most plants and animals living there are quite unique and many even dangerous to the unprepared or the unaware. But why do people say this about this place, and not anywhere else? To answer this question we need to take a look at the planet’s distant past. Complex life began to take a foothold on land during a time when all present-day continents were connected, forming a super-continent known as Pangaea. About 180 million years ago, this immense landmass began to break apart in two large chunks. One of them was Gondwana. This huge piece of land was comprised of South America, Africa, India, Antarctica and Australia. Huge prehistoric forests covered all of these places until they began to break apart as well, slowly moving into their present day locations. Like South America and Antarctica, Australia was floating adrift on the oceans, isolated from all other continents and as a result, developed some truly “alien” life forms, found nowhere else on Earth. But since Antarctica “decided” to become a Popsicle and South America became connected with its northern counterpart some 3 million years ago, only Australia remained with its unique life forms unaltered. When humans first arrived there, some 50,000 to 65,000 years ago, they discovered a land so foreign and with creatures so strange and deadly, their present-day counterparts can’t even compete. This was an age for the mega-fauna, and we’ll be discussing 10 of them, in no particular order. Up to this point, the largest of the Australian megafauna to have ever been discovered on the continent is the Diprotodon. Often times compared to a rhinoceros, this herbivorous beast measured 10 feet long by 6.5 feet tall, and weighed 6,100 pounds, making it the largest marsupial mammal to have ever existed. Since the remains of hundreds of creatures have been found all over Australia, it is relatively safe to say that no other animal from that time period or location was larger. Initial findings suggested that there were more than one possible species of Diprotodon, with some being smaller than others. This was later disproven since it’s now generally accepted that the fossils found belonged to both males and females, which were somewhat different in size. A relative to the present day wombat, the Diprotodon had toes which pointed inwards and which were especially suited for digging burrows. But given its immense size, it’s unlikely for the Diprotodon to have done so, and was most likely a family trait inherited from smaller burrowing ancestors. It is more probable that it used its claws to search for roots. Its pouch was also facing backwards, which didn’t allow for any dirt to collect inside while digging. And since it was so big, it had little to worry about in terms of predators. Up until the arrival of man onto the Australian continent, some 60 thousand years ago, full-grown Diprotodons had only to look out for creatures like the Varanus priscus, or the Quinkana. What caused their disappearance around 55,000 years ago is still a matter of debate among archaeologists. While many have pointed out a possible connection between their extinction and the arrival of humans in Australia, this is most likely just part of the story. As the continent has been slowly drifting north, the region was experiencing a drier climate, which together with the new arrivals most likely drove the Diprotodon to extinction. Like the previously mentioned Diprotodon, which resembled a wombat but at a much larger scale, another of Australia’s most iconic animals, the kangaroo, also had a prehistoric “giant” version of itself. Living mostly in areas with tall trees and shrubs, Procoptodon took advantage of its 6.5 foot size and 10 foot reach to grab foliage out of range of most other herbivorous creatures at the time. Since Australia was slightly cooler than it is today, the habitat of this giant kangaroo was greater than any other megafauna living on the continent, and it was the most commonly found of the kangaroo species. Together with two enlarged fingers tipped with curved claws on each hand, as well as front facing eyes, giving it depth perception, the Procoptodon could easily wrap around tall branches and pull them down to the mouth, similar to how the giant ground-sloth, Megatherium, did in the Americas at about the same time. This theory is also backed up by the size and shape of its skull. Having a shorter snout than present day kangaroos, this giant had the ability to chew through tough vegetation and branches, often found in drier areas. Despite its large size, Procoptodon was still under threat from many of Australia’s top predators. Its best measure of defense was its speed. Similar to present day kangaroos, Procoptodon hopped rather than walked, giving it an impressive swiftness. And as a measure of last resort, it could always lean back on its tail, kicking and punching its opponent into submission. Granted, this technique was mostly used on rivals for mating rights, but a Procoptodon would still kick a predator right in its kisser if it had no other choice. Being so widespread throughout Australia, it is still a mystery as to why it went extinct. Even the timeframe of its disappearance differs from one scientist to the next, with some saying it happened about the time of the arrival of man, with others believing it to be much later, about 20,000 years ago. While hunting alone could not account for their complete disappearance, many believe that a major contributing factor was “fire stick farming” where vast expanses of forest were set ablaze to encourage fresh growth of plants that are more easily consumed by man. This severely reduced the availability of plant types favored by Procoptodon and, in time, led to its eventual demise. Though not exceptionally large, Thylacoleo (Marsupial lion) was among the top predators and the biggest carnivorous Australian mammals to have ever hunted the Pleistocene megafauna, like the giant Diprotodon or the abundant Procoptodon. And this “killing machine” was a true oddity of nature, even by Australian standards. For starters, its teeth don’t resemble those of an ordinary predator, but rather that of a rodent. Its front incisors were greatly enlarged, taking the place of canines as their “main weapon.” Its carnassial premolars were also shaped like blades, used for shearing flesh and bone. Initially scientists believed that Thylacoleo used these teeth for eating nuts and fruits, but later research has shown that their use was better suited on necks and spines. Its jaws were incredibly powerful. A 220 pound Thylacoleo had a bite force equal to a present day, 550 pound lion. This meant that, even if it was a mere 5 feet long, it could easily bring down much larger prey than other predators its size. Another interesting fact about its bone structure was its tail. The vertebrae here seem to indicate that it had strong muscles, which in turn gave it the ability to use it as support when tackling a Diprotodon or another Thylacoleo male. Another feature, not commonly found among marsupials, was its retractable claws. This feature kept its razor-sharp “hooks” from going blunt and which allowed for extra grip on prey animals. It’s also strongly suggested that, just like today’s leopard, Thylacoleo had the ability to climb trees and jump on its unaware prey from above. This theory is backed by its rear feet, where the first toe was reduced but displayed a rough pad, similar to present-day possums, and which make for a better grip when climbing. Given many of these adaptations, it is strongly believed that Thylacoleo evolved from a previously herbivorous animal, like a possum ancestor (Phalangeroidea) or from a common ancestor shared with wombats and koalas. This is highly unusual since most carnivorous mammals draw their lineage from previous meat-eating animals. Whatever the case, it is certain that Thylacoleo was a feared creature by early human settlers, and could compete with all other predators of Pleistocene Australia. The last of the “thunder-birds” to go extinct on the Australian continent, Genyornis (jaw-bird), was a contemporary of early man on the continent and may have coexisted for 15,000 years before it eventually disappeared. This is justified by some fossils found alongside human artifacts, as well as some cave paintings depicting flightless birds, similar to the size and shape of Genyornis. Although not the largest bird to have ever walked over Australia, this goose-like creature was over 6.5 feet tall and probably weighed somewhere around 550 pounds. Its diet is still a matter of debate among scientists, with many believing that it was an herbivore. While this was most likely the case, there is still a chance that Genyornis was also a partial scavenger. With small, stubby wings, and powerful, hoof-like legs, this bird has all the characteristics of a plant-eater. 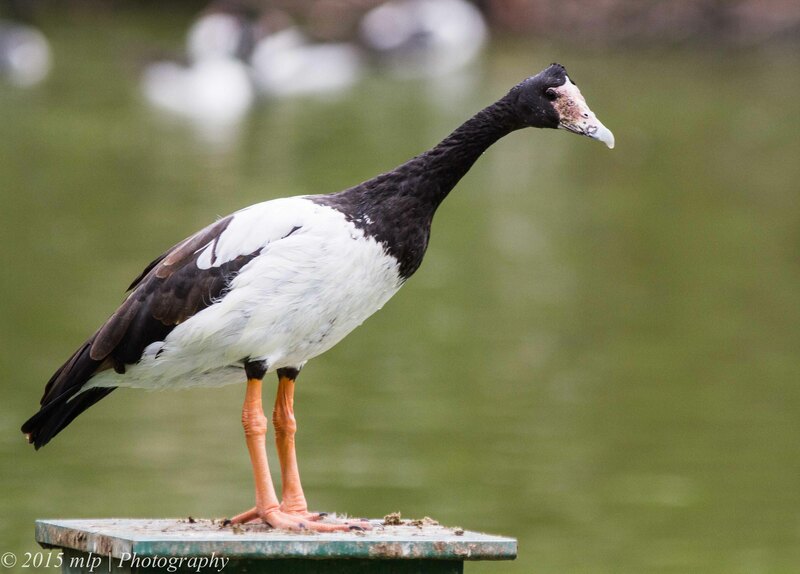 However its beak, though not similar to a raptor or predatory bird, was huge, comparable (but much larger) to that of a Magpie Goose. The lower jaw of Genyornis was exceptionally deep and heavily ossified; a condition unusual in birds. This odd feature is also the main reason for the debate regarding its diet and is somewhat considered to be just a case of evolutionary overdesign. In terms of habitat, Genyornis had a wide distribution on the island continent, preferring open forest and savannah-grasslands. Eggshell fragments have been found in sand dunes, and Genyornis may have used them as nesting sites. Due to the shifting position of Australia on the planet’s surface, these places became more and more arid, which may have better suited the Emu, and slowly pushed Genyornis newtoni into extinction. When its first skull fossil was discovered, Meiolania was classified as a lizard, hence the name which basically translates to “small roamer.” But since then, and with other, more complete fossils later found, it turned out that Meiolania was in fact a turtle. Not only that, but it was one of the largest land turtles to have ever existed. And the main reason for why it was initially believed to be a lizard was the fact that its skull was “beautifully adorned” with a series of spikes, somewhat like the present day horned lizard. Even so, scientists still don’t know where to properly catalogue it, either as Cryptodira, which fold their necks under their spines, or as Pleurodira, which fold their necks to their sides. This 8 foot long “devil” couldn’t do either, because of its horns. But besides these defensive weapons on its head, Meiolania was also fitted with a spiked tail which was most likely used to deter predators from attacking it from behind, just like the huge, South American glyptodons of the Pleistocene. There were several subspecies of this horned land turtle, somewhat varying in size. The smaller ones were endemic to the islands off the eastern coast of Australia, and their smaller stature was attributed to a phenomenon known as insular dwarfism. Their disappearance about 2,000 to 3,000 years ago is mostly attributed to humans who hunted them to extinction in both Australia and the surrounding islands. In Vanuatu for example, remains of the species Meiolania damelipi have been found in the rubbish dumps of early human settlements. And according to these findings, it seems that it took only about two centuries for these turtles to go extinct on these Pacific islands. Though more closely related to snakes than lizards, Varanus priscus was an enormous monitor “lizard” which roamed large parts of Australia, even after the appearance of man there. Not a whole lot is known about this prehistoric reptile since no complete fossil has ever been found, but based on what we do have so far, it is generally accepted that it was a whopping 20 feet long. Some recent theories, however, do make it a bit smaller. One could think of Varanus priscus as a Komodo Dragon from Indonesia, but twice as long, and with a much bulkier build. And like this present day “dragon,” our once mighty beast could have used venom and bacteria in its saliva as a sort of chemical weapon against its prey. If this was the case, then Varanus priscus would possibly be the largest venomous animal ever to have existed. Because of its isolation from other landmasses, Australia only partially gave way for mammals to become the dominant fauna. Since it was home to large flightless birds that went extinct far later than in other parts of the world, it was also the place where marsupials flourished, even though they originated from South America. So why not have reptiles among its top predators? While it competed with Thylacoleo for food, they went about getting it in a slightly different manner. Varanus priscus was most likely an ambush predator, opting to take its prey by surprise and spring on it from the underbrush. Since it wasn’t suited for long-distance chases, though it could charge at tremendous speeds, venom and bacteria in its saliva could have come in particularly handy. And since it was a cold-blooded killer, literally, it would have required less food than its warm-blooded counterparts. It may have also been a great scavenger, tasting the air for carrion with its long, forked tongue. What’s particularly enthralling about this beast is the fact that people aren’t 100 percent sure it’s extinct. Australia is a big place, you see, and most people live in restricted areas, while some parts of the outback remain unknown to this day. There have even been some reports of large lizard sightings and unexplained large animals, like cattle, that have been completely butchered and torn apart. And while there have been cases of female Komodo Dragons reproducing via parthenogenesis (without sexual reproduction), it would only take a few Varanus priscus females to keep the line going. Though not technically from Australia, the Moa lived on the relatively close-by island nation of New Zealand. While there were 11 species of Moa, the largest, Dinornis (Terrible bird), was the island’s equivalent of a giraffe. New Zealand was the last temperate region on Earth to be colonized by humans, roughly 700 years ago, and these first people, the Maori, sailed upon a land full of naïve animals. Even if the female Moa reached 11 feet high (one and a half times taller than the males, and 3 times as heavy), they’d never seen people before, and despite their name, they were quiet, docile herbivores. With no dedicated land predators, the Moa developed in such a way as to thrive on the ground, going so far as to renounce their wings altogether. Even their plumage had “devolved” into a more primitive hair-like structure, offering it insulation while also being waterproof. With its eggs 100 times the size of a hen’s, people soon enough acquired a taste for both them and the giant bird itself. And so much so that, in a mere one century after their arrival, the bird went extinct. It didn’t even have time to develop a sensible fear for this new, two-legged predator. Since it happened a mere 600 years ago, ample evidence of this phenomenon is found all over New Zealand. Moa remains have been found in old rubbish mounds all over the islands, which most likely fed the ever increasing number of feral dogs, the kuri, brought there by people. These dogs, fire stick farming, as well as the people themselves, all drove these birds into the history books, and are a great example of how early man was a major contributing factor to the extinction of the planet’s megafauna of the last Ice Age. Since we’ve talked about New Zealand’s largest herbivore, it’s only fair to say a few words about its predator. Since there were no land predators to speak of, Moa’s threat came from the sky. And that threat was Harpagornis moorei, more commonly known as Haast’s Eagle. Though not the biggest flying bird to have ever lived, Haast’s Eagle had a 10 foot wingspan and, comparable to its size, it was extremely heavy (females could reach some 40 pounds). It also specialized in hunting the Giant Moa. The way it went about achieving this task is somewhat unexpected. While large birds are usually gliders, scouring the land for potential prey from way up in the air, while carried by the currents, Haast’s Eagle relied more on maneuverability and speed. It’s a bit hard to imagine that a 40 pound flying bird could take down a 550 pound creature, but it did so with relative ease. Given its small wingspan, relative to its weight, it is evident that this bird of prey was suited for forested areas, able to make tight turns. And with feet and claws as large as a modern day tiger’s, Haast’s Eagle would swoop down on a Moa, grip its back and break its spine, even before this gentle giant knew what hit it. Since there were no other predators to speak of that could challenge this bird of prey, the eagle could feast from the carcass for several days. Like the Moa, the Haast’s Eagle suffered the same fate, going extinct shortly after its prey, only a mere six centuries ago. Measuring in at an astounding 20 feet long, the Quinkana was a land crocodile that lived in Australia from about 20 million years ago to roughly 40,000 years ago. Its disappearance coincides with most other mega-creatures of the last Ice Age and is thought to be a result of the first humans arriving on the continent. In this case however, this may not have been the case directly, but it’s quite possible that Quinkana was out-competed by human hunters when it came to available prey. Its name derives from the “Quinkans,” a legendary folk from Aboriginal myths. As we mentioned, this mighty crocodile was a land dweller, as compared to modern day crocodiles which are mainly aquatic. We know this because its legs were better able to support and carry the body clear off the ground, as opposed to a present day crocodile, which is only able to push itself along on its belly. This adaptation gave the Quinkana the ability to keep up a long chase, exhausting its prey in the process. Another distinctive feature was its teeth. While aquatic crocs have conical teeth, which are great at gripping and holding onto prey while it drowns in the water it’s dragged into, Quinkana had knife-like teeth, perfect for slicing through a softer bodied prey item like a mammal. In order to properly end this list, we’ve decided to do so with a small, spiky creature. Well, when we say small, we mean it as a comparison with the others on this list. Though not many fossils have been found, from what we do have so far, it is believed that Zaglossus hacketti was the largest monotreme mammal (mammals which lay eggs) to exist, being slightly over 3 feet in length and weighing some 65 pounds. Smaller versions of this creature still exist today in Australia and New Guinea and are sometimes called spiny anteaters, even though they share no relation with these South American animals. Similar to the other Echidnas living in Australia today, Zaglossus’ body was covered in spines for protection. Its hind legs were longer than those in front, giving it the ability to stand and use its forward limbs for digging termite nests. Its trumpet-like, downward curving snout was equipped with a 1.7 foot long, sticky tongue, and it’s quite possible that, besides termites and ants, Zaglossus also ate grubs, beetles, worms, and other invertebrates. The remains of this sheep-sized, spiked anteater were found alongside charcoal and with burn marks upon them, giving way to the possibility that Aboriginal people of old used to cook and eat it regularly. Further evidence found in cave paintings, which depict creatures similar to Zaglossus hacketti, place both it and humans in the same timeframe. Dear TopTenz, the picture above for this article is of prehistoric animals from New Zealand, not Australia. These are the Haast’s eagle and moa respectively. Yes, true, but both those creatures are talked about in the article. And both are mentioned to be from New Zealand. Really it’s true… both those creatures are talked about in this animals. but I also think same to New Zealand….